Exciting news! 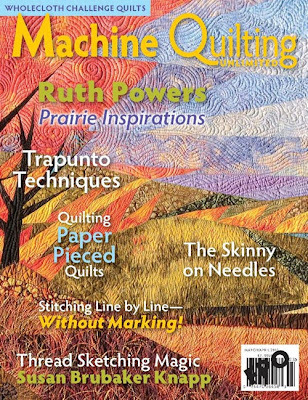 My work will be featured in the May/June 2013 issue of Machine Quilting Unlimited. This issue features work by Ruth Powers, Helen Goddard, Charlotte Warr Anderson, and Barbara Hollinger, among others. My work is included in their “In the Studio” feature. It will be available in late April at select independent quilt shops, Barnes & Noble and Jo-Ann’s Fabric & Craft Stores nationwide. Machine Quilting Unlimited is a fabulous magazine with in-depth articles on machine quilting techniques. If you haven’t seen or read it before, you are in for a treat! They have a special deal going between now and April 10: if you live in the U.S. or Canada and subscribe or renew a one-year print subscription, you get a 20% discount on the subscription price. (That’s a 42% savings over the subscription price.) The promotion code is SPRINGBREAK.